Blame the success of SUVs and crossovers. 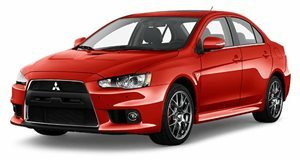 To our dismay, the legendary Mitsubishi Evolution has been dead for a few years now. Unfortunately, the unwavering popularity of SUVs means that Mitsubishi doesn’t see much business sense making sports cars anymore. Case in point: the , but as a compact crossover instead of the sports coupe the name used to be associated with. Sadly, the Evo could suffer the same fate. Mitsubishi hasn’t ruled out bringing the iconic name back on a future model, but it won’t be the rally-bred sedan we all remember. Instead, it will “probably be different from what it’s currently.” Those are the words of Mitsubishi’s UK Managing Director Lance Bradley when discussing the future of the Evolution during an interview with . When asked about the possibility of the iconic Evo name returning, the Managing Director said "There’s nothing in the pipeline at the moment, but anything’s possible – nothing’s ruled in and nothing’s ruled out," he said. "If there were to be one it would probably be different from what it’s currently. The day of the very high-powered sedan car from us is probably gone, but as long as it lives up to the ideals the Evo demonstrated there’s no reason why we couldn’t do it with a different kind of vehicle. Our focus is on SUVs and electrified drivetrains,” he continued, “but it’s possible that there could be an option for a more performance-orientated version of one of the models. The hybrid market is still developing, but an electric drivetrain is usually quicker than an internal combustion powertrain, so you can have some very exciting electrified drivetrains." Applying the iconic Evo name to an SUV could upset many of the performance sedan’s longtime fans. Bradley is very aware of this, however, acknowledging that the company has to treat the Evo name with the utmost respect. You do have to be very sensitive," he said. "It’s an iconic car and there’s a lot of people with a very emotional attachment. If you’ve got an icon you’ve got to be careful not to do anything that undermines it, and sometimes it’s better to leave things alone, rather than undermining it." We wouldn’t be at all surprised if we see a performance SUV with an Evolution badge in the near-future. Limited to 1,600 examples, the Evolution was given its swansong with the special Final Edition back in 2015. RIP.